We invite you to enjoy the history of the home and its surroundings. You’ll find that from the beginning, the house was destined to entertain guests. Dr. Clarence H. Bailey was born in 1868 in Clayton, New York. He received his Doctorate of Dental Surgery from the University of Michigan in 1896 and practiced in Detroit. In 1897, he married Charlotte Conover and in 1908 they migrated to Oregon with their son, William. The home was constructed in the transitional box style. It was one of the few houses in this style in Douglas County with a two-story veranda and gable roof. In 1927, the Baileys added to the rear of the house, enclosing a kitchen nook that once served as the wood shed, a laundry room, and three bathrooms. In 2006, we enclosed the upstairs veranda and added a two-story wing to the west side of the house. In 1909, Dr. Bailey began farming their acreage. 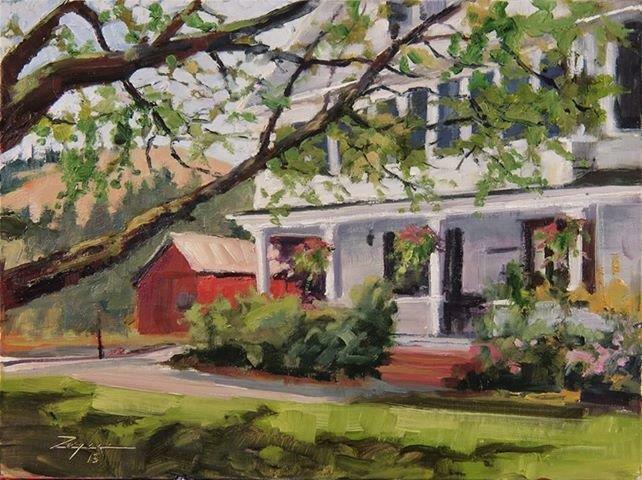 The Bailey farm comprised of 50 acres all in fruit bearing orchards. Thirty acres were dedicated to apples: Newtowns, Delicious, Spitzenberg, Gravenstein and Winter Bananas. Twenty acres were in prunes, peaches and cherries. 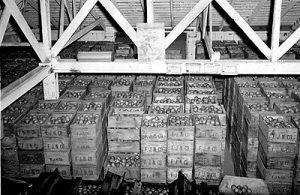 The Baileys sold their apples under their own label, ConleyCott Orchards, locally and at coastal areas in Oregon. The name was chosen as a combination of Dr. Bailey’s mother’s maiden name and Mrs. Bailey’s mother’s maiden name. Sadly, there are only a couple remaining fruit trees. In the 1950’s, the Baileys uprooted them to replace them with Christmas trees. Dr. Bailey was a founding member of the South Deer Creek Grange, No. 440 in 1911 and served as its first Master. He also served as Master of the Pomona Grange (a county-wide organization made up of subordinate granges) and during his incumbency the broccoli industry of Douglas County was developed from a purely local industry to one shipping to all parts of the United States. The South Deer Creek Grange is situated about a ½ mile from the Bailey House and in 2000 was converted into a family residence. Projects such as better roads, rural mail service, and improvements in education were upper most in drawing membership to the Grange. Dr. Bailey was Fruit Inspector for Douglas County from 1911-1912, served as editor of the Oregon Grange Bulletin from 1929 until 1940, and was a member of the Oregon State Grange Executive Committee from 1922-1932. He is listed in the Who’s Who in Oregon, Biographical Dictionary of Men and Women Who are Building a State, Vol. I, 1929-1930, Oregon City Enterprise Publishers, Oregon City, Oregon, page 28. The property remained in the Bailey family until 1990 and Dr. Bailey’s grandson lives locally with his wife and family. They have visited the home providing us with an original ConleyCott Apple crate label and pictures of the Baileys sorting apples in the barn. 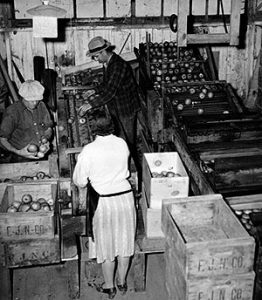 One picture shows the wife of William Bailey, Winona, sorting apples while wearing nylons, heels, and a skirt! Those were the days!